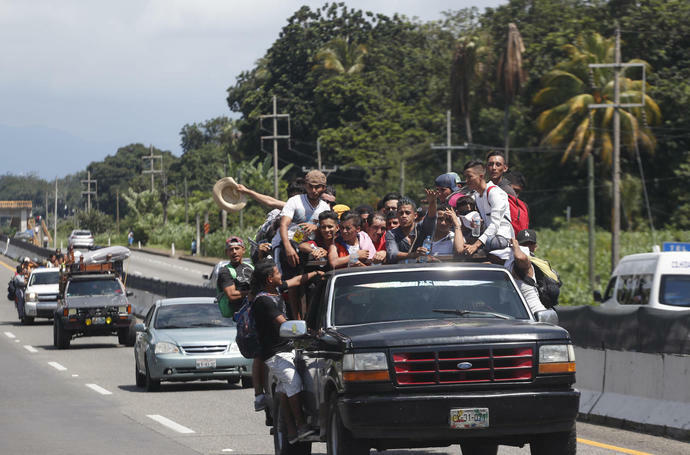 WASHINGTON (AP) - President Donald Trump said Monday the U.S. would begin "cutting off, or substantially reducing" aid to three Central American nations over a migrant caravan heading to the U.S. southern border. On a three-day campaign swing to Western states last week, Trump raised alarm over thousands of migrants traveling through Mexico to the U.S. and threatened to seal off the U.S.-Mexico border if they weren't stopped. As the migrants continued their northward march about 900 miles from the U.S. border, Trump tweeted that, "Sadly, it looks like Mexico's Police and Military are unable to stop the Caravan. He added: "I have alerted Border Patrol and Military that this is a National Emergy." White House officials could not immediately provide details.